King’s Food Bank has been feeding vulnerable people in Kendal thanks to £10,000 from the Cumbria Fund. People in the area go hungry every day for many reasons such as homelessness; redundancy; illness; benefit delay and sanctions; domestic violence; debt or family breakdown. The charity provides food boxes containing 3-4 days of nutritional, non-perishable food for those who are temporarily unable to provide for themselves. The food boxes are a short-term emergency support, sent out in response to referrals from professional agencies such as Adults Social Care; Children’s Services; Barnardo’s; South Lakes Housing and Manna House. Food isn’t the only benefit received. With the support of the Food Bank and its partners, people are able to find strategies to cope and move on from their difficulties, so they don’t become dependent on long-term help. Since receiving the grant, the Food Bank has received 726 referrals from agencies and distributed 13,691 meals to individuals and families, feeding 899 adults and 414 children during this time. 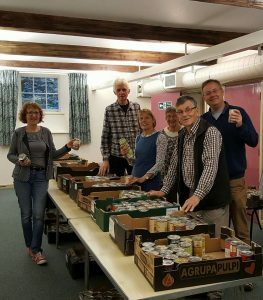 Founded by members of the Kings Church in 2012 and based in the Shakespeare Centre, the Food Bank has become a vital part of the town, making a huge difference to peoples’ lives. Linda Sutherland, Manager of the Food Bank said: “Food poverty in Kendal is very much hidden but it’s a reality that many people sadly have to face here in our town.